Grenlec was awarded the “Best Distributed Generation Project” award for its recent multi-site solar photovoltaic installations in Grenada. 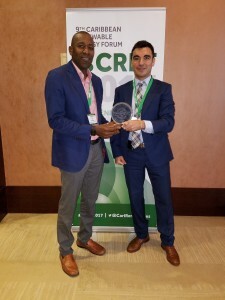 The award was one of seven new Caribbean Renewable Energy Forum (CREF) Project Awards that recognise excellence in project execution in the Caribbean. CREF is the premier renewable energy conference of the Caribbean marketplace. The awards were announced on October 19, 2017 at the annual CREF conference in Miami, Fla.
Grenlec’s award-winning solar project consists of multiple rooftop, car port, and ground-mount solar installations in Grand Anse, Queen’s Park, Plains – St. Patrick for a total capacity of 937 kilowatts (kW). This project is one of several clean energy initiatives Grenlec has pursued over the last decade to increase renewable energy generation. Other projects include the ground-mount solar farm in Petite Martinique, rooftop installations at multiple schools and care institutions, as well as the Customer Renewable Energy Interconnection Programme—the first of its kind in the Caribbean. According to Eric Williams, Grenlec’s Manager of Transmission and Distribution, the multi-site project represents an innovative approach to increasing solar energy generation while overcoming the lack of suitable, available land. “We are honoured to receive this award,” said Mr. Williams. “Grenlec is 100% committed to developing new renewable energy resources in Grenada to help stabilise electricity prices for a more sustainable future.” says Williams. The solar photovoltaic systems were installed for Grenlec by Sofos Energy, a renewable energy company headquartered in Spain with regional offices in the Caribbean. Award recipients were chosen by the CREF Project Award advisory group, comprised of leaders from regional entities such as CARILEC and CARICOM, and regional and international finance organisations. For more information on the awards, visit http://newenergyevents.com/cref-2017-project-award-winners-announced/. “Best Distributed Generation Project” Award with Juan Mayoral, CEO of Sofos Energy. 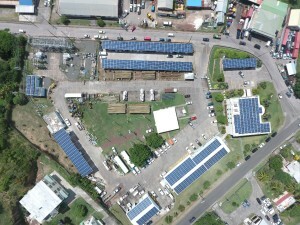 Aerial view of Grenlec Grand Anse facility solar installations. What Will It Take to Develop More Renewable Energy in the Caribbean? Caribbean Clean Energy: Which Markets to Watch in 2019?